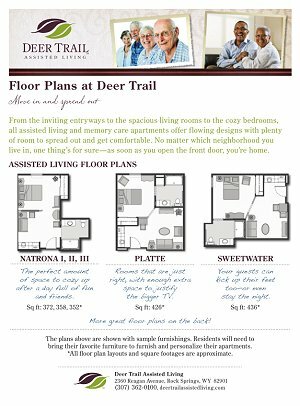 Whether you are listening to music by the warm fire in the great room, playing with cards with friends or taking your dog for a walk outside, there is something very special about Deer Trail Assisted Living. Starting with our cozy apartment homes where you will find inviting entryways to spacious living rooms to the cozy bedrooms. Our apartments are just right, with enough extra space to justify the bigger TV. 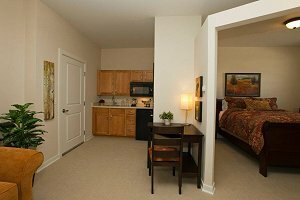 All of our apartments offer flowing designs with plenty of room to spread out and get comfortable. 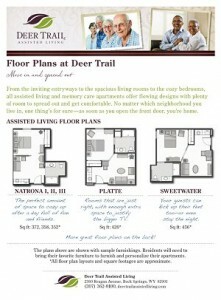 The plans shown below are shown with sample furnishings. 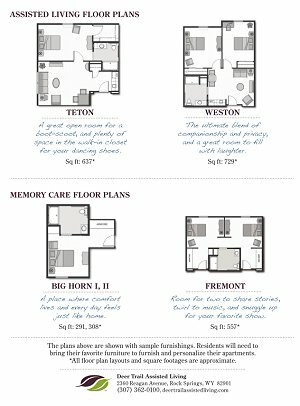 Residents will need to bring their favorite furniture to furnish and personalize their apartments. All floor plans layouts and square footages are approximate. … all assisted living and memory care apartments offer flowing designs.